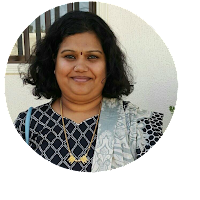 For the Second Week of Blogging Marathon#29, i have chosen Course-wise Meal from any State. I Chose Bengali Sweets. So, for the next 3 days i will be posting Bong Sweets!!! I m starting with Chanar Jallebi or Paneer Jalebi. 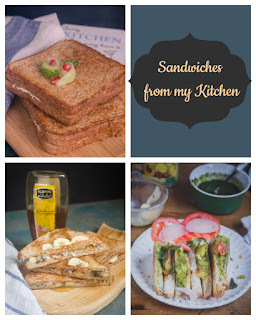 This was the Challenge given to us by Chandrani Banerjee of Cuisine Delights for SNC Challenge. What is SNC? 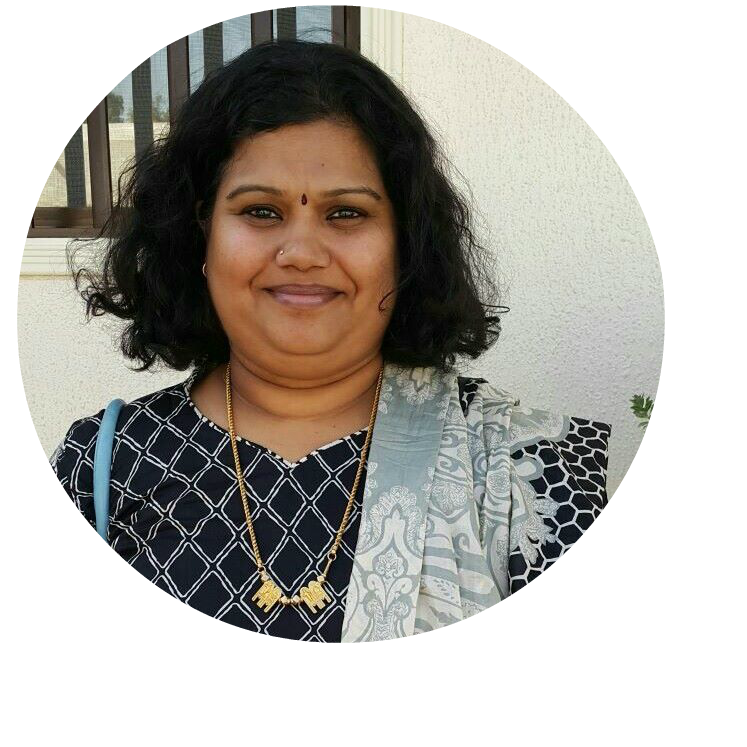 A Monthly Fun Challenge, organised by Divya Pramil of You too Can Cook. We have two teams, the South team and the North team and every month each team member will challenge the other with an authentic recipe of their team. 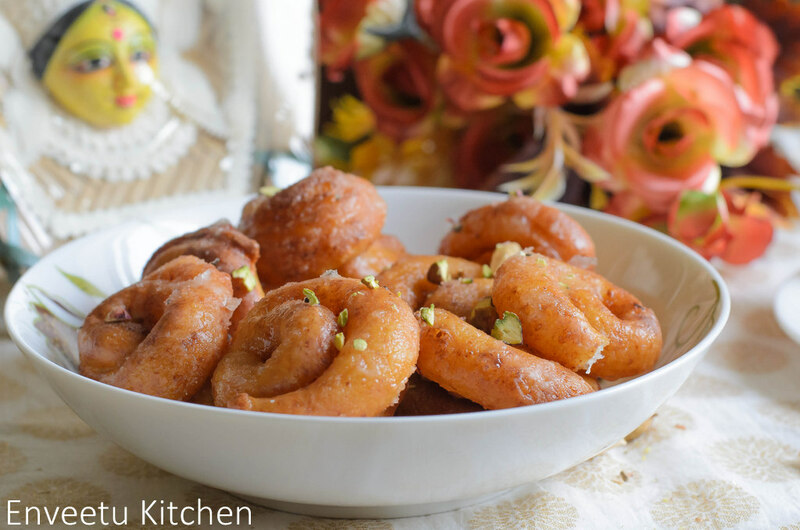 This month, we got an Bengali Delight, Chanar Jalebi, an authentic sweet prepared on festive occasions. The jalebi's were light and great on taste. Boil milk in a heavy bottom pan and add the lemon juice. Keep Stirring, until the milk starts to curdle and let the whey water become clear.Line a sieve with a muslin or cotton cloth. Pour the curdled milk into it. 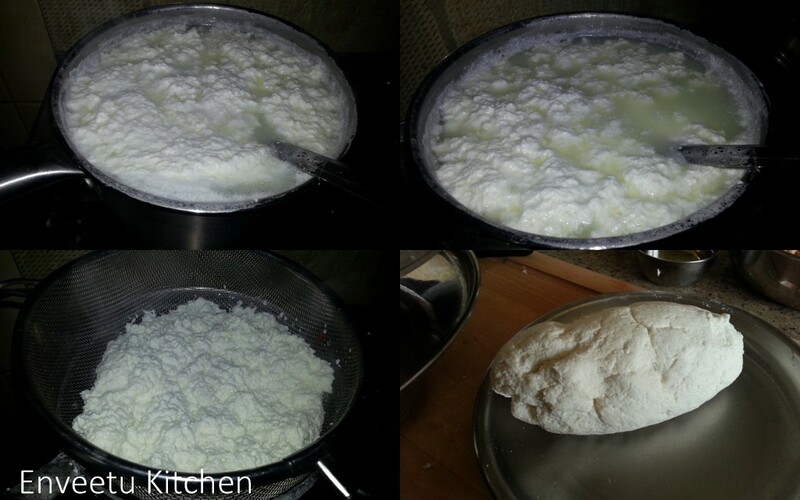 Wash the Strained Paneer under running water to remove the strains of lemon juice added. Place the sieve on a bowl and set it aside for 30 minutes until all the water has been drained out. Remove the paneer from the cloth and transfer it to a plate. If not going to use immediately, then cling wrap it and refrigerate. 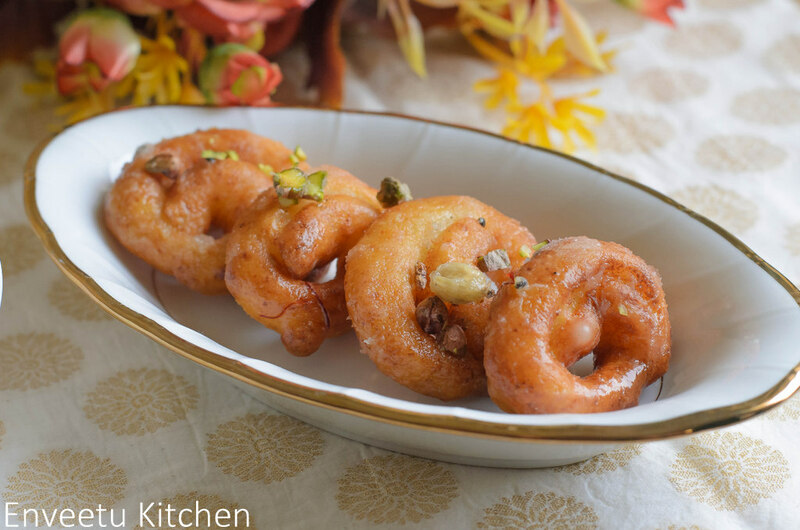 If making jalebi immediately, then add maida, baking powder and cardamom powder to the paneer and Knead to form a smooth dough. Once formed, let the dough rest on the kitchen counter. To make the Sugar Syrup, Take Sugar, Water, saffron and cardamom pods in a Sauce pan and bring it to boil. Let it boil in a low flames until the syrup becomes little sticky.Remove from the flame and set aside. In another pan heat oil for deep frying. 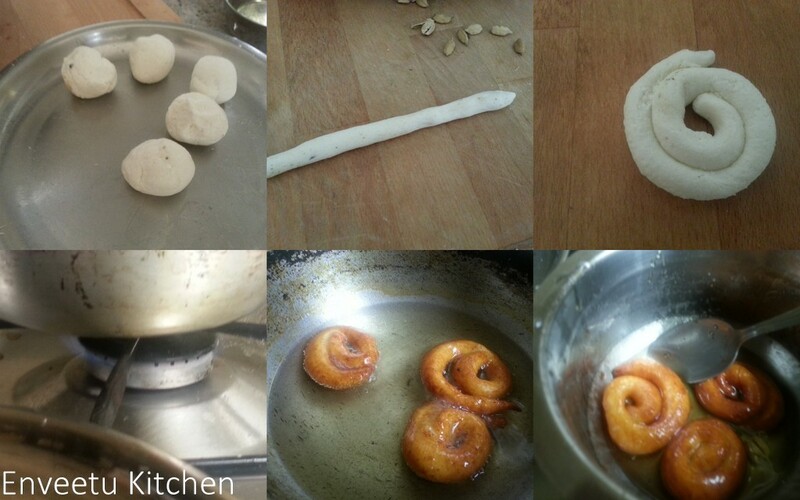 Pinch small balls out of the dough and roll the ball into a long thick rope. Shape the rope into a pretzel or just a swirl. Deep fry the jalebis until nicely they are golden brown. Remove from oil and add it to the warm syrup. Repeat the process with rest of the dough. Let the jalebi's soak in the syrup for 3-4 hours. Garnish with sliced pistas and serve. I made the paneer the previous day night and the jalebi's next day morning. So i kept the cottage cheese in the refrigerator cling-wrapped. Next day, After removing from the refrigerator, i kept it on the counter for 30 minutes. I didn't add Milk to make the dough, since my dough was moisten enough to get a smooth dough. Looks just like the store bought ones - Picture perfect. 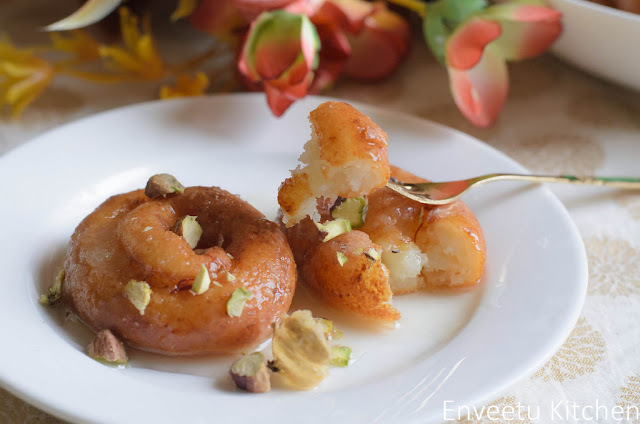 Thanks for de-mystifying these bengali sweets. I've always thought they were too complicated to try. Will try these. Looking forward to other bengali sweets too. They came out extremely fabulous Priya, super colour neegha wish panna madhriye pannitinga,kalakals. I am in love with those jalebis...aw!..wish could grab some ..they look too good.Bookmarked! They look so gorgeous. Perfectly done. 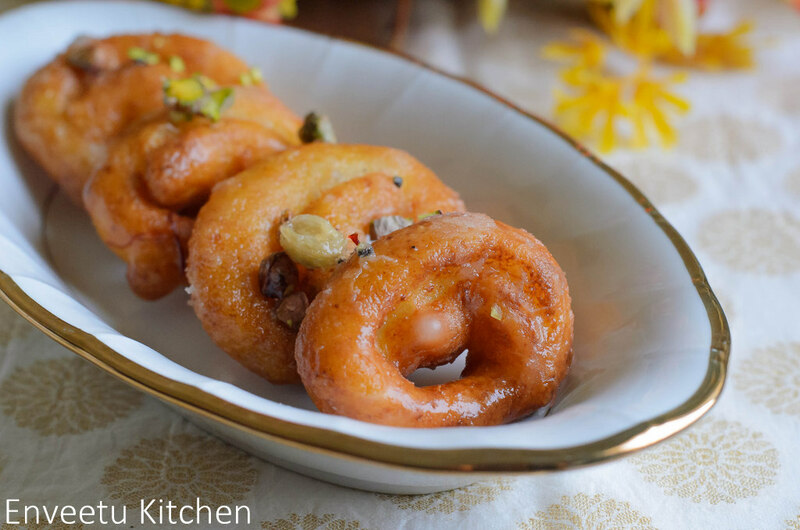 Still in my to do list, you made them so perfectly looks so mouthwatering..
Paneer jalebi came out perfect and sure it tastes delicious! 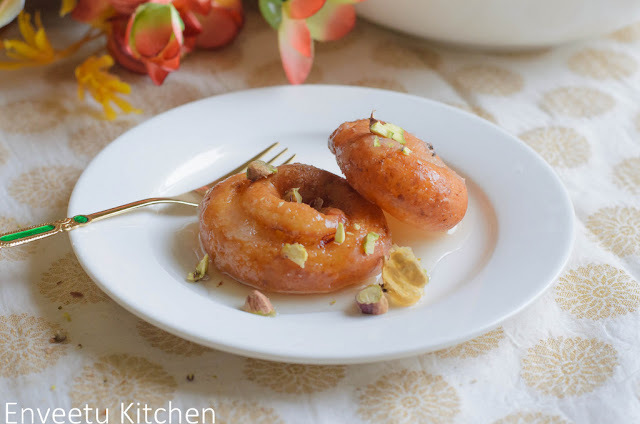 these look more like doughnuts than the sticky jalebi confection. these I would def try!!! Wow ! Wow ! No words !!! Speechless ! Wow this looks yum. I love the step wise pics. Awesome. Looks very delicious.. the inside looks so moist and wonderful.. Love the Bengali form of goddess Durga.. The jalebis have come out so well, Priya. Jalebis look perfect.. Lovely clicks. I'm eyeing that dainty fork you have in the pic -- very nice. I love any sweet with paneer. :) These look my cup of tea and a very neat presentation. Bookmarked! you got it perfectly.. looks awesome dear.